I conditioned my bales with blood meal and waited to plant. We did have a few cold nights but not freezing. Tomatos are trying to grow but most blossoms fall off and leaves are curling and small. Bales are moist,I have lots of runoff water.I have tried less water, more water, fertilizer. They get lots of sun. Should I just start over? I must protest very strongly against "straw bale gardening". This must be the worst case of "Wasting Water" I have ever come across.It also comes across as a gimiky overuse of bales to grow a few plants on top of a straw bale when the bale can be broken open and used as a mulch on a far biger or smaller area to "Save water".The straw then becomes part of the ongoing sustainable growing medium as it rots down. By the way the straw also acts as a warm blanket in the cooler months. Please sensible gardeners think before you gimic. Rather looks like some sort of chemical problem, has there been any spraying nearby? What about spray residue in the soil or bale? Or the fertilizer was too strong possibly. It might take a while for those plants to ever come good, so starting over might be best. Thanks Bill t, that's a good point, and I've amended my website page straw bale gardening. You'll see I've put a warning box there with a note about being water wise and using the strawbale method only when there are limited other options for a decent garden. I don't feel this is a gimmick I feel this is a great option. I am newly disabled and I can't work my "regular" garden. Last year I put 4 container pots and grew just a few things. Also I will eventually want raised bed gardens for myself however this year I am still to hurt and more importantly to broke to do a proper raised bed yet so that being said I can still have my first love which is growing my families food but I can also adapt this "bale" garden for my needs and my money needs. When the straw hay ect breaks down to much I can reuse it for other things so it's a repurpose and recycle situation = win win ...and lastly the watering NEED for this project is EASILY remedied with a little imagination....people just need to think outside the box! Ok thanks for the article and anyone who doesn't agree should just keep doing things the way they do agree with instead of putting other people down!!! I've been using straw bale gardening to build the soil at the base of my sloped front yard. I have constructed an outer barrier to support the bales so that they don't slump onto the sidewalk. At the start of each growing season, I push the composted dirt into a series of piles, then use about 1/3 to 1/4 of a bale to fill in each of the gaps. Honestly, I don't grow a whole lot in the bales themselves, mostly flowers or ground cover plants, but the compost in between is Dynamite! This seems to do a good job of keeping things moist. I should set up a drip system to further conserve H2O, (someday!) but overall, things seem pretty happy. 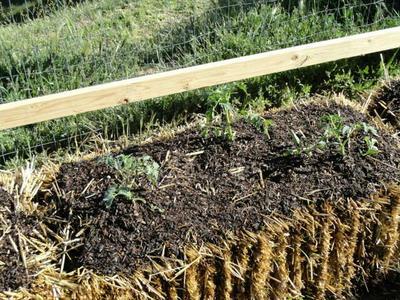 Using mulch or leftover straw between plants has also been a pretty successful moisture-retention strategy. I know I'm lucky to be able to garden in a region with such abundant rainfall, and I'm sure I'd need to alter my system if I lived in a more parched region. It's not that excessive. A lot of people have poor or (potentially) toxic soil, or very little soil at all, so they can't plant in the ground. Any kind of container gardening uses more water, and raised beds of any kind do as well. Most people waste more water daily in the house than they'd use in straw bale gardening. I'd rather encourage people to try straw bale gardening than to worry about the slight increase in water usage. Skip flushing your toilet every time you pee and you'll save more water than you use with straw bales. I had not had much luck with growing vegetables until I tried this method. WOW! It is easy, no weeding, no bending, no digging. Watering is no issue as I am not watering any more than I water other plants in the yard. Rain barrels are the answer for many of us. Although I am a huge fan and am experiencing great yields and healthy plants (heirloom tomatoes, cukes, bell peppers) in Wisconsin, my son who is an avid gardener in Vermont and has always raised most of his produce tried straw bales this year and he is really frustrated. Plants are barely alive, growing slowly, yellow. I think he may have planted while bales were too hot? What are some other ideas about why he is having no luck? Anyway, I am never going back! No gimmick. Simple success! We started with 2 plus year old bales and that for us was the success ticket. In the high desert of central Oregon the new bales (even the conditioned ones) would not work well... but the aged bales are the best. If water use is an issue, why not wrap the bales? re-used plastic wrapped around the bales should keep in most of the water that otherwise runs off. Granted, plastic is not everyone's idea of beauty, but I don't think the plastic need to go all the way up the bales, just underneath and up to the first string should make a 'bathtub'. Use transparent plastic to see waterlevel in the tub. Bags from mattresses and the like should easily be big enough. I have grown on straw bales inside a greenhouse and outside. by using strawbales I use one layer of plastic to cover my greenhouse. I did this in NW Ontario, Canada. I used black plastic and wrap the bales and framed them with wood slabs from a sawmill. The first soaking is where it took a most of the water. I put 6" of soil on top of the bales and this help conserve water. The ones I did outdoors I put a tent over and the warmth of the bales extended my season by 3 weeks on each end. Usually have a frost by Labor day. Never had a problem with any vegetables. I have done something similar in the past which worked very well. We built a raised bed with wood rounds stood up on end, I live in the woods so that was easy. I'm sure you could replicate this with any type of raised bed, that's just what I had to work with. The raised bed can be any height as you stand the rounds on end. We did not dig them in, but that would probably work better. We filled the raised bed with alfalfa hay, which is very high in nitrogen and has enzymes in it that suppress weed growth. We placed about four to six inches of soil on top and planted directly in the soil. The plants were extremely happy! There was no transplant shock. They didn't require as much water as planting directly in soil, pots, etc. The alfalfa hay breaks down very quickly when soil is placed on top, one experiment I did with placing soil on top of the alfalfa showed me that the alfalfa broke down to beautiful, dark, rich soil in about two months or less. Bale gardening is not a "gimmick" or a waste of water. Give me a break. Like another poster I am disabled and doing bale gardening has been wonderful for me. It has been something I can manage and enjoy. Being outside in the sunshine and doing something useful and productive has helped me so much. I love going outside each morning to see the progress. I have radishes, onions, tomatoes. peppers, garlic, cucumbers, carrots, cantaloupe, squash, zucchini, and chives. The watermelon isn't doing so great, but oh well. It is hanging in there, I found a nifty little trellis to guide the plant vines. I also found some free pallets to put the bales on to give a little more added height and drainage. what needs to not be in your straw ??? I don't think you need to worry about any leftover chemicals with straw bales. Any weed or herbicide residues would have long gone once the bales are baled. And when you condition the bales all that heat and water will have made the bales pretty much okay. Never had a problem and I've never known whether the bales come from organic farms or not. We are new to this and are having success but today I noticed some wierd looking bubble things beside my tomato plant. Loks like gray ticks but aren't, just squushy. Any ideas? When you are trying to start a new garden in Caliche desert "soil",clay, etc, growing healthy vegetables is not always possible. (Also, the ground may have been poisoned by pesticide or chemicals in some areas) But, you can do so with straw or hay bales. Once my bales were conditioned, there was little if any run off when watered properly. If you are concerned about water conservation, wrap your bales with something, even cardboard, and hold it in place with twine or wire. The next year, put another bale right on top of the first one....you'll be building super soil. Those squishy grey bugs -are they spittle bugs? Images and info on Spittle bugs. I had a great first year with this method last summer! Our soil is poor and our season is short and we were impressed at higher yields from planting in soil. I started some new bales for this year. I'm using hay again and was hoping to plant something in last season's bales. They are pretty broken down. I've heard that you can plant potatoes. What else would do well? Not sure about potatoes because the growing tubers have a habit of poking up out of the soil and you need to cover them to stop the light turning them green and poisonous. Loose straw itself is great for this, pile it on your growing spuds. But maybe not so easy to do on a strawbale. For ideas on what to grow and more info click strawbales. What to Plant in loose last year bales? "They are pretty broken down. I've heard that you can plant potatoes. What else would do well?" Actually, potatoes would be perfect, but other than that...just about anything. How did the hay work out for you? Was it fresh hay? If so, how long did it take to be "conditioned"? Wanna explain how you did it? The reason I'm asking is that I'm considering using hay bales as opposed to straw, which have become scarce in my neck of the desert. HI, I'm using it this year too, I have a new to me garden spot that needs seasoning and testing. The "inventor" of straw bales gardening is Joel Karsten. I got his most recent book at the library. It is excellent for answering all questions and speculations. He's a life long farmer growing up on his family's farm and has a degree or two as well.He tells a wonderful story. Anyway, I think that's the place to start. I'm planning to use a drip hose too, which is the way to go for water conservation. Intrepid soul, read the instructions for ideal straw bales effect by the originator of the method: Joel Kristen. I picked up his second Straw Bale Gardens Complete at the library. He is bright, congenial and talented, along with being a 2nd or 3rd generation farmer. To boot,he has a degree in agriculture or some such thing. It is an inspired read. Of course, a drip hose is essential to my m8nd, but so is the way you orient your bale. Great read. You can polish off instructions in one or two evenings. You may find more time perusing and studying is really helpful and down right fun!